Anyone who has ever watched prime time television has heard of Travelocity. With their humorous Traveling Gnome commercials, they’ve made themselves a household name in travel booking. Owned by the online travel corporation, Expedia, Travelocity has been dedicated to helping consumers “wander wisely” for over a decade. Their 24/7 customer support and their wide variety of services, including a well-designed mobile app for travelers on the go, makes Travelocity one of the top choices for the budget-friendly vacation of your dreams. Based in Houston, Texas, Travelocity offers you the ability to book, travel, stay, and move on all from a single website. Because Travelocity is one of the big names in online travel booking, consumers expect them to be knowledgeable about all the deals and packages that can be found. But is this trust misplaced? For most users, the answer is a resounding no. 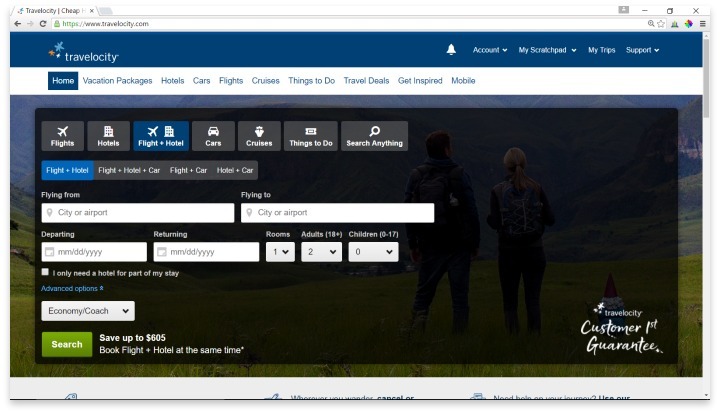 Travelocity’s great features are easy to use, and offer any kind of traveler plenty of ways to book their perfect trip. While some of their best tools for constant travelers can be hard to find, a thorough search of the website reveals multiple ways to keep up to date on all the best deals. There’s a desktop app, a mobile app, and even an add-on for Internet Explorer that will keep you in the know. Travelocity is one of the few free travel booking websites that features package deals that include car rentals. This makes it a very popular choice for business travelers. Travelocity themselves don’t charge any fees for changing or cancelling your booking, and their deals section gives you the information you need to score the best budget flights and hotels possible. Travelocity also offers a travel insurance option, which can help you recoup the costs of cancellations, lost luggage, and medical care that you may need when outside of the country. This option is available for anyone who purchases a Trip package through Travelocity. This isn’t to say that Travelocity is without flaws. You must search by specific dates, rather than a range of possible dates, when looking for flights or hotels. Most consumers report that Travelocity’s prices are not the lowest that can possibly be found, either, which doesn’t bode well for the traveler on a strict budget. They do have a “low price guarantee”, but you’ll have to search the web for the lowest price yourself and bring it to Travelocity for them to match it. Many users also found the online website to be confusing, and the extra features like the desktop app can be buried in the site map. The site does allow you to sign in with your Facebook account for quick sign up, which some users find convenient. Travelocity provides 24/7 customer support and their wide variety of services makes Travelocity one of the top choices for the budget-friendly vacation of your dreams. For the busy traveler always on the go, and who needs to book trips in a single one-stop shop, Travelocity is an excellent choice. It’s easy to connect to their services no matter where you are, and the packages mean you can get in and out in no time. If you are looking to get the best deal and compare many options, you may wish to check out another site. Have you had an experience with this company? Please share your Travelocity reviews below.